I have a soft spot for Berlin’s Tempelhof Airport, which was built between 1934-36 and mothballed seventy-odd years later. Yes, it is a symbol of Nazi Germany but, even though its pedigree is suspect, the audacious sweep of the curved building, the 50m-wide canopy to cover the aircraft and its intimidating scale – like all Nazi-era public buildings it was intended to make you feel very small indeed – was and is very impressive. Sir Norman Foster called it the ‘mother of all airports’ – after all, the main terminal building is a stunning 1.2 kilometres long. 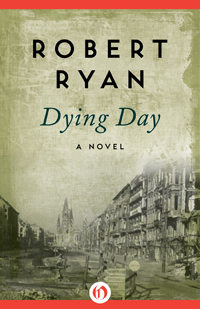 It also featured in my novel about the Berlin Airlift of 1948, Dying Day, re-issued this week by Open Road as an e-book in the USA (see http://www.openroadmedia.com) and I spent a fair amount of time back in 2006-7 poking around the airport. It’s a great idea. Much is being made by Berlin of the 25th anniversary of the wall coming down in November. 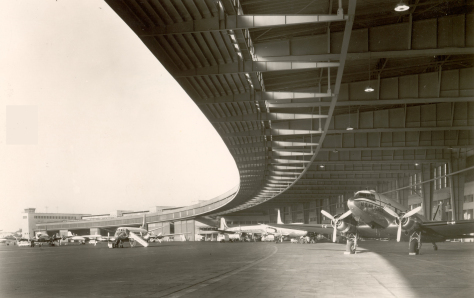 2018, though, is the 70th anniversary of the Airlift, an almost equally important bookmark in the city’s history. It would be very apposite to have something opening on the roof of Tempelhof by then, overlooking the field where the constant flights saved the city from starvation. This entry was posted in Uncategorized on March 26, 2014 by Robert Ryan. Re Templehof. Rob, I have memories of Templehof in the late 1970’s when the USAF used it as offices and barracks. Some of the rooms looked out from the third floor into the hanger area and had interesting sight lines around the supporting struts. It was a piece of history I will not forget–that and the fact that the enlisted mess hall used real china and flatware and served the best food in military Berlin. Won’t say fond memories, but certainly good ones.